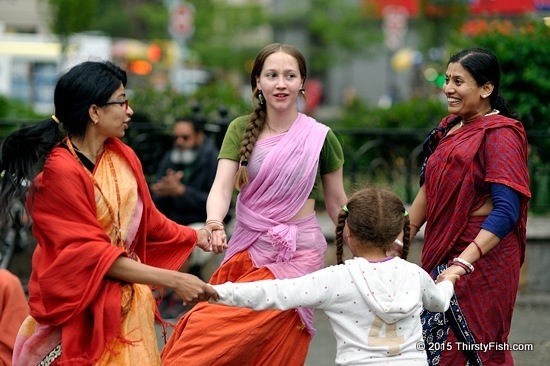 Hare Krishna dancers at Union Square. Ever since the Age of Enlightenment, we've been repeatedly promised that science, technology and sociopolitical progress was going to improve our lives and the lives of all humanity. After World War II, this suggestion played a pivotal role in transforming citizens into consumers. We were told that if we bought stuff our lives would be evermore qualified. All of this turned out to be a deceptive sales pitch. A vast majority of us are not personally happier or better off. Science, technology and progress has left us with potentially catastrophic environmental and social problems: Infinite wars, resource depletion, pollution, overpopulation, extinction, erosion, climate change, inequality, managed democracies, etc. Even those who claim to live the good life often don't. Dragging yourself out of bed six in the morning, commuting to work in rush hour traffic, moving though crowds and crowds of people who are a facsimile of yourself, answering to unreasonable bosses for doing the same exact thing you do every day, and then commuting back home in exhaustion is not the "good life". Just because you get a paycheck or don't work two jobs, it doesn't mean your life is good. Constantly buying stuff does not make the self-contempt go away. Unfortunately, there is no cure for this robotic existence, so many become escapists or turn to medication or "realize" their existence in front of the television set. People don't have friends anymore, just colleagues and people who they share tweets and Instagram photos with. That's it. A great majority of us are disconnected from nature, from society, from our own nature and from life itself. Our mechanical existence does not make any sense. We all are alone together. Science and technology have transformed us into zombies, and we have forgotten what it means to be a human being. No, I'm not a Hare Krishna, but I appreciate the idea of a "simpler and more natural way of life".